Manufacturer of a wide range of products which include reaction vessel. For reasons of making the finest Reaction Vessel available to our clients, we engage in the using of high grade raw materials and modern machines. Owing to this, the product is known to have an impeccable performance and a longer service life. Further, for reasons of quality maintenance, the offered products are manufactured following the set industry norms and guidelines. We fabricate the vessels according to the customer's specification as well as according to the various codes, governing procedures for design, fabrication inspection testing and operation of pressure vessels from mild steel, stainless steel or of cast iron. Our standard size of vessels having gross capacity and in five different variety. 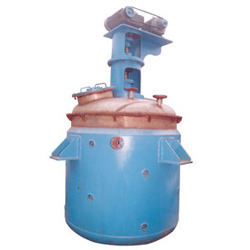 Such as, with both dish end, with flanged or welded top, with or without jacket or limpet coil, with open top (E) with flat bottom, The reaction vessel serves in chemical industries, dye & intermediate fertilizer, petrochemical and refinery.